The famed architect reprises his role as set designer for the Academy Awards. Yesterday, he gave us a backstage tour. This year, with Alec Baldwin and Steve Martin splitting emcee duties, the show is built for comedic timing. The stage is eight feet wider than it was last year, and features three “turntables” or rotating circular platforms, to accommodate the faster-paced back-and-forth of this year’s hosting tag-team (there is also a rumor that Tina Fey will appear as a “surprise” third host, which of course no one will confirm or deny–but here are three turntables). Instead of the slinky, crooner-inspired sets of last year, Rockwell looked to classic soundstages where variety shows like the Frank Sinatra and Dean Martin shows were filmed. “This set needed to have the ability to be really funny,” says Rockwell. The addition of two hosts is one of several historic changes for this year’s Oscars. The best song nominees will not be performed live, eliminating the need for additional performance area set ups. And this year’s decision to bring back 10 nominees for best picture (which has not happened since 1943) also delivered Rockwell the challenge to stage the presentation of 10 film-inspired numbers instead of five–another reason for the quick-change spinning discs. And of course, the star of the show is still the 100,000-Swarovski crystal curtain, but 16 additional inches of topaz crystals were added to add a level of smokiness that matched this year’s color scheme. The curtain even has a name, appropriately, Crystal, whom Rockwell refers to on a first-name basis, like a proud papa. Rockwell and I sat down next to Quincy Jones–well, the cardboard photo of his likeness, one of hundreds of confirmed celebrity attendees propped up into chairs throughout the audience (Danny Elfman’s 2D visage was in the row in front of us)–and I realized that the Kodak Theatre, normally a cavernous 3,400-seat venue, which Rockwell himself designed a decade ago, has been rendered surprisingly intimate. “A lot of the show is in the audience,” says Rockwell, who once again tore out the seats in the front half of the theater and replaced them with supper club-like seating, midnight blue carpet and 150 tiny crystal lamps. Rockwell has also placed the orchestra on stage again, eliminating the pit and ensuring that the front row is spitting distance from the hosts. To further draw the TV viewers into this circle of interaction, Rockwell has slipped cameras under the stairs in the stage, allowing them to capture a unique shot from the presenters’ point of view, looking out from behind them into the audience. Cameras will also swing the full distance through the theater and onto the stage to lend a sense of depth, and bronze mirrored architectural elements–which are more Modernist than last year’s Deco–were added to catch another glimpse of celebrity reaction as they stroll on-stage. A colonnade of inflatable white, lit fabric pillars will create a 3D texture along the side and back walls of the stage, which can also be projected upon and used for stage entrances and exits. One of his favorite moments of last year was feeling the dazzled audience react to a very genuine surprise: The first time giant LED screens cracked open like eggshells to reveal five veteran Oscar winners presenting that year’s acting awards. “That’s where the live part comes in,” he says. “Design is just one element. It’s how the camera captures those moments.” This year a combination of front-projection and LED screens will be used to present the same awards, but that’s all he’s going to say about that. In fact, Academy Awards are shrouded in such secrecy that infiltrating them is like passing through security under a threat-level as red as the legendary carpet. After two credential checks, I was whisked through the bowels of the Hollywood & Highland Mall (yes, you have to walk through a mall to get to the Oscars, did you know that? 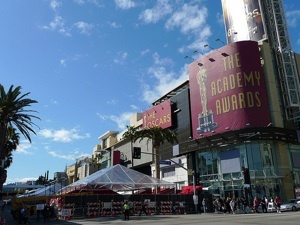 ), past checkpoints manned by alarmingly-serious young people with walkies hooked into large khaki vests, and just when I’d completely lost my sense of direction–I’m sure they did that on purpose–I surfaced directly onto the mythical Oscar stage. So it shouldn’t surprise you that no photos were allowed for my visit–I’m lucky I was able to find my way out at all. 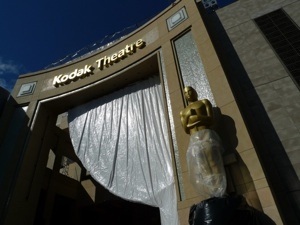 That means you’ll have to watch the Oscars this Sunday to see Rockwell’s vision come to life. We’ll check back in with him then to see if the set was indeed a worthy foil to the comedic stylings of Baldwin & Martin (that sounds really good, doesn’t it? ).